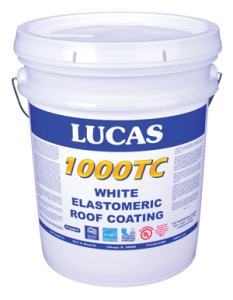 Lucas Elastomeric Roof Coating is applied to an existing APP modified bitumen roof. The applicator pictured on the left is spreading the coating evenly with a notched squeegee while the applicator on the right back-rolls the coating to provide a smooth, uniform finish. Note that on older asphalt and modified bitumen roofs there may be some exudate ‘bleed through’ when the first coat is applied. 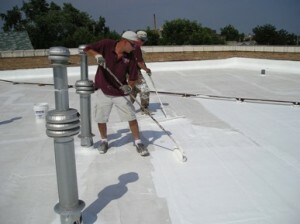 The second coat will be bright white as shown.